The landscapes of North America, including eastern forests, have been shaped by humans for millennia, through fire, agriculture, hunting, and other means. But the arrival of Europeans on America’s eastern shores several centuries ago ushered in the rapid conversion of forests and woodlands to other land uses. By the twentieth century, it appeared that old-growth forests in the eastern United States were gone, replaced by cities, farms, transportation networks, and second-growth forests. Since that time, however, numerous remnants of eastern old growth have been discovered, meticulously mapped, and studied. Many of these ancient stands retain surprisingly robust complexity and vigor, and forest ecologists are eager to develop strategies for their restoration and for nurturing additional stands of old growth that will foster biological diversity, reduce impacts of climate change, and serve as benchmarks for how natural systems operate. Forest ecologists William Keeton and Andrew Barton bring together a volume that breaks new ground in our understanding of ecological systems and their importance for forest resilience in an age of rapid environmental change. This edited volume covers a broad geographic canvas, from eastern Canada and the Upper Great Lakes states to the deep South. It looks at a wide diversity of ecosystems, including spruce-fir, northern deciduous, southern Appalachian deciduous, southern swamp hardwoods, and longleaf pine. Chapters authored by leading old-growth experts examine topics of contemporary forest ecology including forest structure and dynamics, below-ground soil processes, biological diversity, differences between historical and modern forests, carbon and climate change mitigation, management of old growth, and more. This thoughtful treatise broadly communicates important new discoveries to scientists, land managers, and students and breathes fresh life into the hope for sensible, effective management of old-growth stands in eastern forests. "Breaks new ground in our understanding of ecological systems and their importance for forest resilience in an age of rapid environmental change...This deftly edited volume comprised of 15 erudite contributions by experts in their fields covers a broad geographic canvas, from eastern Canada and the Upper Great Lakes states to the deep south...Ecology and Recovery of Eastern Old-Growth Forests is a thoughtfully informative treatise that broadly communicates important new discoveries to scientists, land managers, and students, and breathes fresh life into the hope for sensible, effective management of old-growth stands in eastern forests." "An important contribution to the burgeoning literature extolling the virtues of forest complexity. As a compendium of the literature on forest heterogeneity alone, this book is an indispensable reference for scholars and practitioners of ecological forest management." "Ecology and Recovery of Eastern Old-Growth Forests is extremely timely and hugely important. Old-growth forests are quickly disappearing, and global changes mandate that we find new approaches to manage them. Succinctly written by prominent American and Canadian scientists, this book is a must-read for forest professionals and enthusiastic forest lovers everywhere." "Finally, a much-needed, up-to-date treatise on the state of old-growth forests in the East. All forest stakeholders should read this book." Chapter 5. Topography and Vegetation Patterns in an Old-Growth Appalachian Forest: Lucy Braun, You Were Right! Chapter 8. Is Management or Conservation of Old Growth Possible in North American Boreal Forests? Read or download the annotated table of contents here or below. The landscapes of North America, including eastern forests, have been shaped by humans for millennia, through fire, agriculture, hunting, and other means. But the arrival of Europeans on America’s eastern shores several centuries ago ushered in the rapid conversion of forests and woodlands to other land uses. By the twentieth century, it appeared that old-growth forests in the eastern United States were gone, replaced by cities, farms, transportation networks, and second-growth forests. Since that time, however, numerous remnants of eastern old growth have been discovered, meticulously mapped, and studied. Many of these ancient stands retain surprisingly robust complexity and vigor, and forest ecologists are eager to develop strategies for their restoration and for nurturing additional stands of old growth that will foster biological diversity, reduce impacts of climate change, and serve as benchmarks for how natural systems operate. 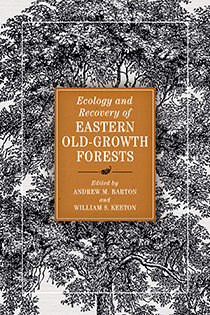 Forest ecologists William Keeton and Andrew Barton bring together this thoughtful treatise to broadly communicate important new discoveries to scientists, land managers, and students in Ecology and Recover of Eastern Old-Growth Forests. Together they breathe fresh life into the hope for sensible effective management of old growth stands in eastern forests. Check out Chapter 8 “Is Management or Conservation of Old Growth Possible in North American Boreal Forests?” below, or download the PDF here.